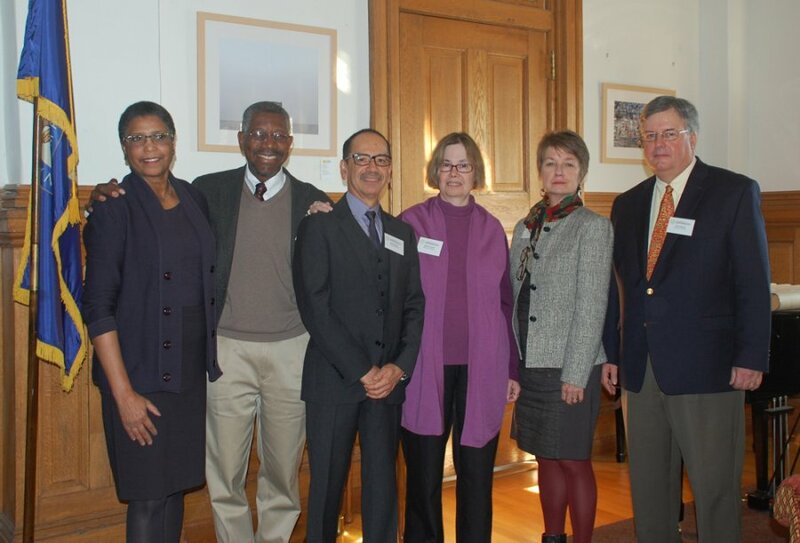 The National Endowment for the Humanities welcomes five new members of the Endowment’s advisory board! The National Council on the Humanities meets three times a year to review grant applications and to advise the NEH Chairman. Members serve staggered six-year terms. New members Gerald L. Early, Dorothy M. Kosinski, Ramon Saldivar, Katherine H. Tachau, and John M. Unsworth were nominated by President Barack Obama in June, July, and September 2012 and January 2013 and confirmed by the U.S. Senate in January and August 2013. Gerald L. Early is Director of the Center for Humanities, Merle Kling Professor of Modern Letters, and a Professor of English at Washington University in Saint Louis. Since 1982, he has held various positions at Washington University, including Professor of English, African and Afro-American Studies, and Director of the American Culture Studies Program. Dr. Early serves on the Board of Advisory Editors of Oxford Companion to African-American Literature and is a Member of the Board of Trustees of the Missouri Historical Society and the Advisory Board of The Antioch Review. He is the author of One Nation Under a Groove: Motown and American Culture and The Culture of Bruising: Essays on Prizefighting, Literature, and Modern American Culture, which won the 1994 National Book Critics Award. Dr. Early received a B.A. from the University of Pennsylvania, and an M.A. and Ph.D. from Cornell University. Dorothy Kosinski has served as Director of The Phillips Collection since 2008. Prior to joining The Phillips Collection, Dr. Kosinski worked at the Dallas Museum of Art, where she served in a number of capacities from 1995 to 2008, last as Senior Curator of Painting and Sculpture. From 1985 to 1997, she worked with the Douglas Cooper Collection of cubist art in Basel, Switzerland. She also served as an independent curator of major exhibitions at the Royal Academy of Arts, London; The Kunstmuseum Basel; The Kunstmuseum Wolfsburg; and The National Gallery in Prague. Dr. Kosinski has written and edited many books and catalogs on a variety of art topics including 19th Century Symbolism, Dada, Surrealism, 20th Century sculpture and contemporary art. She currently serves on the Board of the Association of Art Museum Directors and the Advisory Board of The Musée Rodin, Paris. Dr. Kosinski received a B.A. from Yale University and an M.A. and Ph.D. from the Institute of Fine Arts at New York University. Ramón Saldívar is the Hoagland Family Chair in the School of Humanities and Sciences and the Milligan Family Fellow in Undergraduate Studies at Stanford University. Dr. Saldívar’s research focuses on Chicano and Chicana studies, literary theory and post-colonial literature. His publications include Figural Language in the Novel: The Flowers of Speech from Cervantes to Joyce, Chicano Narrative: The Dialectics of Difference and The Borderlands of Culture: Américo Paredes and the Transnational Imaginary. He served on the Editorial Board of American Literature and Modern Fiction Studies from 2003 to 2007, on the Board of Governors of the University of California Humanities Research Institute from 1994 to 1997, and on the National Council of the American Studies Association from 1993 to 1995. Dr. Saldívar received the 2011 National Humanities Medal. He earned his B.A. from the University of Texas, Austin and his Ph.D. from Yale University. Katherine H. Tachau is a Professor of History at the University of Iowa, where she has taught since 1985. Previously, she taught at Pomona College from 1982 to 1985 and Montana State University from 1981 to 1982. From 1979 to 1981, she was a researcher at the Institute for Medieval Greek and Latin Philology at Copenhagen University in Denmark. Dr. Tachau has published extensively on medieval philosophy, science, and art; and has received the John Nicholas Brown Prize from the Medieval Academy of America. In addition, she received the Regents Award for Faculty Excellence at the University of Iowa in 2009, and she has been awarded fellowships from the Stanford Humanities Center, the National Humanities Center, the Guggenheim Foundation, and the National Endowment for the Humanities. Dr. Tachau received a B.A. in Spanish and Medieval Studies from Oberlin College, and an M.A. and a Ph.D. in History from the University of Wisconsin-Madison. John M. Unsworth is the Vice-Provost for Library and Technology Services and Chief Information Officer at Brandeis University. Previously, Dr. Unsworth served as the Dean of the Graduate School of Library and Information Science at the University of Illinois, Urbana-Champaign from 2003 to 2012. Before joining the University of Illinois, he served as the Director of the Institute for Advanced Technology in the Humanities and was a faculty member in the English Department at the University of Virginia. He is the co-founder of Postmodern Culture, a peer-reviewed electronic journal in the humanities. Dr. Unsworth received a B.A. from Amherst College, an M.A. from Boston University, and a Ph.D. from the University of Virginia.